Went to Oshima a few weekends ago. Finally got to tick that one off the list. 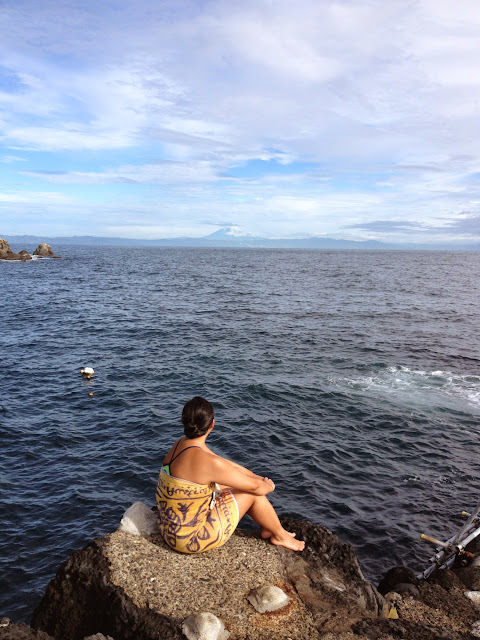 Of the seven Izu islands, I only have one more to do. 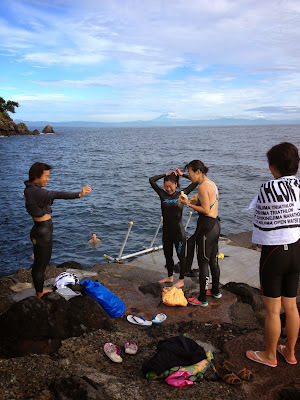 Was in Oshima for a triathlon – not an individual one, but rather a team relay. Naturally, I’d be doing the swimming leg. Unfortunately, and to everyone’s disappointment, it rained. A lot. The race was cancelled. And, of course, the next day was a perfectly sunny day. Oh well, hiked a volcano on the Sunday instead so all was not lost. In the absence of a swim on Saturday, some of us got up early for a pre-breakfast swim. Gotta love a 6am swim on a Sunday. Who needs sleep, right? It was worth it though coz we got to see Fuji. Mount Fuji in all its glory. Was a drastic change from the previous day of rain and cloud. 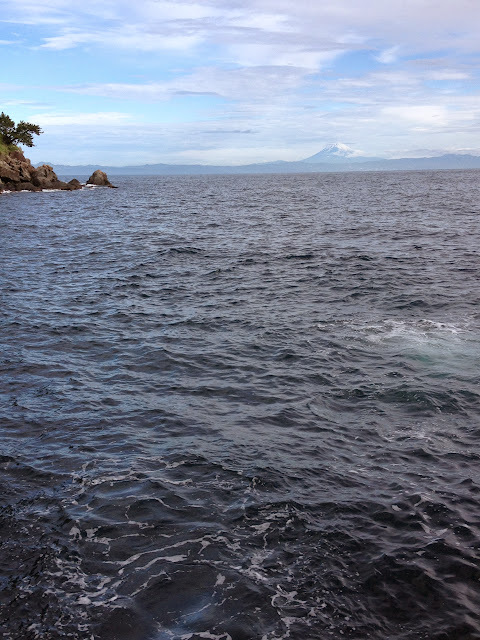 This particular spot was called Akinohama (on Oshima Island). We jumped off from a small rocky point. The water was cold. I’m guessing about 19 degrees. Definitely made the heart stop beating for a second when I first jumped in. Took me a while to get my breathing right. Water was chilly and it was surprisingly choppy. Felt a bit seasick out there. Didn’t help that I was seasick the day before on the boat from Tokyo to Oshima island. We had had some wild wet weather the day before. 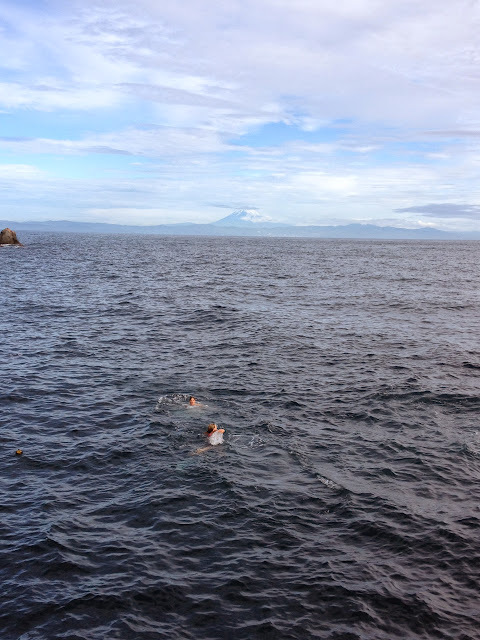 This is open water swimming at its finest. 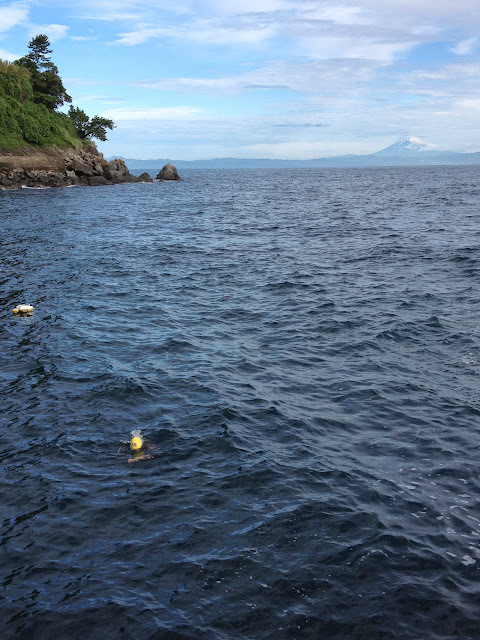 Refreshing cold water with Mount Fuji looking over us. C’mon in!